Objective: This case series reports short- and long-term healing, before and after placement of an implant, in posterior mandibular extraction sites grafted with demineralized, freeze-dried bone matrix (DFDBM) allograft mixed with calcium sulphate graft binder. Methods: Three patients who underwent surgical extraction of a posterior mandibular molar experienced partial loss of the buccal bone plate at the extraction site. 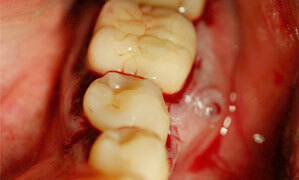 Alveolar bone reconstruction with a DFDBM allograft mixed with calcium sulphate graft binder was performed immediately. The graft was covered with a biodegradable regenerative membrane. For each of the 3 patients, the implant and healing abutment were placed after 6, 9 and 12 months, respectively, followed by crown placement 3, 5 and 5 months later, respectively. The implants were periodically re-evaluated, both clinically and radiographically, between 10 and 39 months after final insertion of the crown. An implant stability device was used to evaluate the long-term biological and functional stability of the implants. Results: Upon exposure and implant placement, the grafted alveolar ridge in all patients presented appropriately sized, dense and well-vascularized bone, wide enough to receive the planned wide-platform implant. The long-term interface stability quotient ranged from 87 to 90. Conclusions: Posterior mandibular extraction sites with compromised buccal alveolar bone may be effectively managed by immediate alveolar augmentation using a mixture of DFDBM allograft and calcium sulphate graft binder. This approach provides ideal alveolar form and consistency for eventual placement of the implant. A question of interest to general practitioners and specialists working in endosseous implantology is how to approach reconstruction of a postextraction alveolar bone defect. In particular, should the graft be placed at the time of extraction, to avoid the possibility of poor bone healing (which would necessitate grafting when the implant is placed)? If so, should an autogenic, allogeneic, xenogeneic or synthetic bone graft material, or a combination of these products, be used for the reconstruction? Accell Connexus demineralized bone matrix putty (Citagenix Inc., Laval, QC) is composed of 70% (by weight) allogeneic demineralized, freeze-dried bone matrix (DFDBM). It also contains human bone morphogenetic proteins (BMPs), specifically, BMP-2, BMP-4 and BMP-7, as well as a transforming growth factor beta 1. All of these substances are important in bone healing.1 Half of the DFDBM remains in the form of particles, while the remainder undergoes solubilization, which results in a flowable carrier with osteoinductive potential.2 Hence, this material has osteoinductive capabilities.1,3,4 The Accell Connexus product also contains 30% (by weight) reverse-phase medium. Once in contact with saliva and blood at body temperature during surgery, this inert carrier renders the DFDBM component denser and more resistant to displacement during compaction at the extraction site. CalMatrix bone graft binder (Citagenix Inc.) is a synthetic putty-like calcium sulphate bone graft binder containing calcium sulphate α-hemihydrate, sodium carboxymethyl cellulose and a hydrating solution. Traditionally, long-term biological osseointegration of dental implants has been clinically evaluated by the absence of pain, the presence of a dull sound on vertical percussion of the implant, stability to reverse torque of 20 N cm, and absence of both peri-implant soft-tissue inflammation and osseous pathology on periapical radiography.1 Devices are now available that allow the clinician to objectively assess the mechanical stability of an implant both at the time of placement and during subsequent follow-up. These devices (e.g., Osstell ISQ, Osstell AB, Gothenburg, Sweden) assign a numeric value for stability, known as the interface stability quotient (ISQ).The ISQ value, first introduced in 1996 by Meredith and colleagues,5 is based on resonance frequency analysis. A successful, biologically osseointegrated implant has an ISQ value of 57 or higher; a value less than 57 indicates increased risk of implant failure. This case series describes 3 patients in whom a mixture of Accell Connexus bone matrix putty and CalMatrix bone graft binder, which together have osteoconductive and osteoinductive capability, was used for immediate postextraction reconstruction of the alveolar ridge, before eventual placement of a posterior dental implant. Three patients presented for treatment of chronic periapical and/or bifurcation osseous pathology of a posterior mandibular molar (Figs. 1 and 2), accompanied by root ankylosis and/or fracture. All 3 patients underwent extraction with creation of a mucoperiosteal sulcular flap, partial ostectomy and complete odontectomy. Following extraction, any remaining granulation tissue was eliminated, and the extraction site was grafted immediately with a combination of allogeneic DFDBM and synthetic calcium sulphate (Figs. 3a and 3b). This avoided the need to harvest autogenous bone for grafting. In each patient, the grafted site was covered with a resorbable type I collagen xenograft membrane (Neomem, Citagenix Inc.) (Fig. 3c). Primary closure of the wound was then performed. All of the procedures were performed by the same surgeon (A-J.C.). Figure 1: Patient 3. Preoperative view of tooth 36 showing chronic fistulous area at the buccal bifurcation. Figure 2: Patient 3. Preoperative periapical radiograph of tooth 36 shows radiolucency at the bifurcation and mesial root areas. Figure 3: Patient 3. Postoperative view following extraction of tooth 36 shows a) osseous defects in the mesiobuccal, bifurcation and interradicular areas; b) placement of the graft; c) the regenerative membrane that has been placed over the grafted site. The surgical site was exposed after a healing period of 6 months for patient 1, 9 months for patient 2 and 12 months for patient 3. At the time of exposure, the grafted alveolar ridge in each patient showed clinical healing of the bone, which had appropriate density, vascularity and width to allow placement, without additional bone grafting, of the preselected wide-platform posterior implant and healing abutment. Final functional restorative treatment was completed by the same prosthodontist (H.C.) at 3 months (for patient 1) or 5 months (for patients 2 and 3) after placement of the implant and healing abutment (Fig. 4). Stability readings were obtained with the Osstell ISQ stability meter (Citagenix Inc.) at postrestorative follow-up at 39 months (for patient 1) or 33 months (for patient 3) after return of full occlusal function. The ISQ values ranged from 87 to 90, indicating good stability. Patient 2 had received a cemented restoration and was therefore unsuitable for ISQ evaluation. Clinical evaluation of all 3 implants showed the presence of a dull sound on vertical implant percussion, stability to reverse torque of 20 N cm, absence of soft-tissue inflammation around the restored implant and absence of peri-implant osseous pathology on radiographic assessment.1 Therefore, it was concluded that all 3 implants were biologically, functionally and esthetically stable (Figs. 4 and 5). Table 1 summarizes the findings for these 3 cases. Figure 4: Patient 3. Appearance of the restorative treatment completed 5 months after placement of the implant and healing abutment in the area of tooth 36. Figure 5: Patient 3. Periapical radiograph of the implant and restoration 50 months after surgical extraction of tooth 36 and immediate grafting, 38 months after placement of the implant and healing abutment and 33 months after placement of the restoration. Osseous density is evident around the entire implant surface, including part of the smooth surface collar. BL = buccolingual value, ISQ = interface stability quotient, MD = mesiodistal value. a Size of implant, as diameter × length. b From time of extraction and grafting. c From placement of the implant and healing abutment. d ISQ of 57 or greater indicates successful, biologically osseointegrated implant; ISQ < 57 indicates increased risk of implant failure. Slow resorption potential, variable replacement of vital bone and the persistence of unresorbed graft particles are other possible factors to be considered with DFDBM grafting.23 Froum and colleagues24 compared healing of extraction wounds filled with bioactive glass or DFDBM with healing of unfilled extraction wounds. After 6 to 8 months of healing, the presence of vital bone (by volume) was 59.5% for extraction wounds filled with bioactive glass, 34.7% for those filled with DFDBM and 32.4% for the unfilled extraction wounds. In the filled extraction wounds, residual particles within the grafted wound accounted for 5.5% (by volume) in the case of bioactive glass and 13.5% (by volume) in the case of DFDBM. In contrast, in a prospective clinical case report, Babbush25 found that the presence of vital bone in extraction wounds filled with DFDBM was higher than that observed by Froum and colleagues.24 Babbush evaluated the healing of extraction wounds in 10 patients who underwent extraction of a single tooth followed by immediate placement of osseous allograft material, with implant placement between 4 and 21 months later. At the time of implant placement, core bone biopsy revealed that vital host bone accounted for an average of 57.5% (by volume) of material at the grafted site. In all cases, the grafted sites were able to support implant placement and final prosthetic loading without failure or complications. It was concluded that if the extraction site is immediately grafted with an allogeneic bone material, an implant can be placed as early as 4 months after the procedure, with only a few particles of unincorporated material remaining at that time. The high financial cost of these materials must be considered a possible disadvantage. In cases like those described here, 3-dimensional bone resorption and remodelling is unavoidable. It is most pronounced in the first 6 to 12 months following even uncomplicated tooth extraction and is even more pronounced after complicated exodontia. Furthermore, such resorption and remodelling is up to 4 times faster at mandibular than at maxillary extraction sites, particularly for the buccal alveolar bone plate, and it has the potential to drastically compromise placement of the dental implant. Grafting of the fresh extraction wound is probably the most predictable way to preserve and possibly augment the quality and quantity of residual alveolar bone.29 The benefits of this approach rely on utilizing the capacity of the alveolar bone for 3-dimensional healing and eventual incorporation of the graft into the homologous bony architecture of the maxilla or mandible. Although autogenous bone grafting remains the gold standard, allogeneic bone grafting is gaining wider attention in the scientific and clinical communities, and some promising results have been achieved in terms of generating excellent quantity and quality of bone for subsequent placement of the implant.25,30,31 The advantages of this approach include unlimited availability, the variety of forms of graft materials available and avoidance of a second surgical site. The disadvantages include absence of the osteogenic and osteoconductive components, potential for disease transmission, potential for graft rejection and slow graft resorption. However, a synthetic graft binder can be added to the DFDBM allograft material to provide osteoconductive capacity. Furthermore, the use of freeze-dried, demineralized allogeneic bone material greatly decreases antigenicity and potential for disease transmission. This case series has demonstrated a favourable clinical outcome in 3 patients who underwent immediate grafting and reconstruction of a compromised residual extraction site (after removal of a posterior mandibular molar) with an allogeneic DFDBM bone graft combined with a synthetic graft binder. This approach allowed for 3-dimensional osseous healing of the fresh residual alveolar bone, which in turn resulted in a large, dense, well-vascularized alveolar ridge and the absence of bone dehiscence at the location of the implant placement. These factors allowed the surgeon to place a one-stage, wide-platform implant and healing abutment where indicated on the surgical guide for each of the patients, without the requirement for additional bone grafting. Placement of the wide-platform implant allowed for a better esthetic emergence profile and an increased resistance to posterior occlusal forces over the long term (Figs. 4 and 5). Clinical evaluation of more patients undergoing similar procedures is required to confirm or refute the conclusion that, when patients are properly selected and the method is appropriately applied, placement of allogeneic DFDBM combined with a synthetic graft binder material is an excellent alternative to autogenous bone grafting, resulting in predictable osseous healing in 3 dimensions. Dr. Almasri is assistant professor, oral and maxillofacial surgery, faculty of dentistry, King Khalid University, Abha City, Saudi Arabia. Dr. Camarda is associate professor, stomatololgy, oral and maxillofacial surgery, faculty of dentistry, University of Montreal, Montreal, Quebec. Dr. Ciaburro is associate professor, restorative dentistry, faculty of dentistry, University of Montreal, Montreal, Quebec. Ms. Chouikh is a third-year undergraduate dental student, faculty of dentistry, University of Montreal, Montreal, Quebec. Ms. Dorismond is a third-year undergraduate dental student, faculty of dentistry, University of Montreal, Montreal, Quebec. Acknowledgments: The authors wish to acknowledge the initial contribution of Mr. Maxime Azais, dental undergraduate student, faculty of dentistry, University of Montreal, to preliminary documentation for one of the patients. The authors also thank Citagenix Inc. for providing the Osstell ISQ device used to evaluate healing of the implants. Boyan BD, Kinney RC, Singh K, Williams JK, Cillo Y, Schwartz Z. Bone morphogenetic proteins and other bone growth factors. In: Orthopedic biology and medicine: musculoskeletal tissue regeneration, biological materials and methods. Pietrzak WS, editor. Totowa (NJ): Humana Press; 2008. p. 225-245. Kay JF, Khaliq S, King E. Osteoinduction of carriers for DBM-based bone graft materials: BMP and growth factor analyses. White Paper for IsoTis OrthoBiologics. October 2005. Keith JD Jr, Salama MA. Ridge preservation and augmentation using regenerative materials to enhance implant predictability and esthetics. Compend Contin Educ Dent. 2007;28(11):614-21. Hoexter DL. Bone regeneration graft materials. J Oral Implantol. 2002;28:290-94. Meredith N, Alleyne D, Cawley P. Quantative determination of the stability of the implant-tissue interface using resonance frequency analysis. Clin Oral Implants Res. 1996;7(3):261-7. Atwood DA, Coy WA. Clinical cephalometric and densitometric study of reduction of residual ridges. J Prosthet Dent. 1971;26(3):280-95. Iasella JM, Greenwell H, Miller M, Hill M, Drisko C, Bohra AA, Scheetz JP. Ridge preservation with freeze-dried bone allograft and a collagen membrane compared to extraction alone for implant site development: a clinical and histologic study in humans. J Periodontol. 2003;74(7):990-9. Sobolik CF. Alveolar bone resorption. J Prosthet Dent. 1960;10:612-9. Irinakis T, Tabesh M. Preserving the socket dimensions with bone grafting in single sites: an esthetic surgical approach when planning delayed implant placement. J Oral Implantol. 2007;33(3):156-63. Mecall RA, Rosenfeld AL. Influence of residual ridge resorption patterns on implant fixture placement and tooth position. 1. Int J Periodontics Restorative Dent. 1991;11(1):8-23. Drakos D, Engler-Hamm D. Ridge preservation: why and when. Implants. 2006;3:20-3. Available: www.fachpraxis.de/pdf/fortbildungen/PDF14.pdf (accessed 2012 Jan 17). Sonick M, Hwang D. Tooth extraction – an opportunity for site preservation. Contemp Esthetics. 2007;11(2):38-43. Zubilliga G, Von Hagen S, Simon BI, Deasy MJ. Changes in alveolar bone height and width following post-extraction ridge augmentation using a fixed bioabsorbable membrane and demineralized freeze-dried bone osteoinductive graft. J Periodontol. 2003;74(7):965-75. Perrot DH, Smith RA, Kaban LB. The use of fresh frozen allogenic bone for maxillary and mandibular reconstruction. Int J Oral Maxillofacial Surg. 1992;21(5):260-5. Present S, Levine RA. Single maxillary tooth restoration. Inside Dentistry. 2010;6(1):58-66. Jackson BJ, Morcos I. Socket grafting: a predictable technique for site preservation. J Oral Implantol. 2007;33(6):353-64. Moy PK. Alveolar ridge reconstruction with preprosthetic surgery: a precursor to site preservation following extraction of natural dentition. Oral Maxillofac Surg Clin North Am. 2004;16(1):1-7. Gomes KU, Carlini JL, Biron C, Rapoport A, Dedivitis RA. Use of allogenic bone graft in maxillary reconstruction for installation of dental implants. J Oral Maxillofac Surg. 2008;66(11):2335-8. Clokie CM, Moghadam H, Jackson MT, Sandor GK. Closure of critical sized defects with allogenic and alloplastic bone substitutes. J Craniofac Surg. 2002;13(1):111-21. Younger EM, Chapman MW. Morbidity at bone graft donor sites. J Orthop Trauma. 1989;3(3):192-5. Marx RE, Carlson ER. Tissue banking safety: caveats and precautions for the oral and maxillofacial surgeon. J Oral Maxillofac Surg. 1993;51(12):1372-9. Cypher TJ, Grossman JP. Biological principles of bone graft healing. J Foot Ankle Surg. 1996;35(5):413-7. Becker W, Urist M, Becker BE, Jackson W, Parry DA, Bartold M, et al. Clinical and histologic observations of sites implanted with intraoral autologous bone grafts or allografts. 15 human case reports. J Periodontol. 1996;67(10):1025-33. Froum S, Cho SC, Rosenberg E, Rohrer M, Tarnow D. Histological comparison of healing extraction sockets implanted with bioactive glass or demineralized freeze-dried bone allograft: a pilot study. J Periodontol. 2002;73(1):94-102. Babbush CA. Histologic evaluation of human biopsies after dental augmentation with a demineralized bone matrix putty. Implant Dent. 2003;12(4):325-32. Drosos GI, Kazakos KI, Kouzoumpasis P, Verettas DA. Safety and efficacy of commercially available demineralized bone matrix preparations: a critical review of clinical studies. Injury. 2007;28 Suppl 4:S13-21. Schwartz Z, Mellonig JT, Carnes DL Jr, de la Fontaine J, Cochrane DL, Dean DD, et al. Ability of commercial demineralized freeze-dried bone allograft to induce new bone formation. J Periodontol. 1996;67(9):918-26. Bae HW, Zhao L, Kanim LE, Delamarter RB, Dawson EG. Intervariability and intravariability of bone morphogenetic proteins in commercially available demineralized bone matrix products. Spine (Phila Pa 1976). 2006;31(12):1299-1306. John V, De Poi R, Blanchard S. Socket preservation as a precursor of future implant placement: review of the literature and case reports. Compend Contin Educ Dent. 2007;28(12):646-53. Steiner GG, Francis W, Burrell R, Kallet MP, Steiner DM, Macias R. The healing socket and socket regeneration. Compend Contin Educ Dent. 2008;29(2):114-6, 118, 120-4. Callan DP, Salkeld SL, Scarborough N. Histologic analysis of implant sites after grafting with demineralized bone matrix putty and sheets. Implant Dent. 2000;9(1):36-44.